Hydraulic hooklift-equipped trucks with interchangeable roll-on/roll-off bodies are an ideal system for scrap metal recycling. Before getting into the unique suitability of hook loaders for this industry, let’s take a closer look at the specialized requirements of scrap metal purchasers. The pay the highest prices for materials that are sorted by the producer of scrap metal at the pick-up site. Why? Scrap metals are melted by recyclers according to strict “recipes.” Ferrous (magnetic) items with iron (e.g., steel) may make up one melt batch, and non-ferrous materials like aluminum, brass or copper may comprise the other. Therefore, it pays the metal recyclers as well as the producers of scrap (e.g., factories, fabricators, etc.) to maintain several containers onsite and segregate loads of metal before they reach the recycling facility. The higher revenue potential in sorted loads has led many scrap producers to implement employee training, create signage and employ color-coding techniques — all in an effort to help their workers separate metals correctly per the needs of the scrap metal purchasers. Holding accumulated scrap in an onsite container until there’s a full load is also a money-maker for scrap metal producers. Why? For metal recyclers, trucking cost for 500 pounds of scrap is the same as 30,000 pounds. As a result, most scrap buyers will willingly pay higher prices if factories can accumulate enough scrap metal to maximize a load because hauling wise, the cost-per-pound will be less. These profit-enhancing measures point to a roll-on/off container or several (for segregating purposes) that can be left on site until filled before pickup. Of course, no system does this better than a hydraulic hooklift. Cable loaders are an option, to be sure. 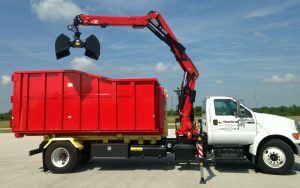 But for several important reasons they do not measure up to the benefits of a hooklift-equipped chassis and multiple containers at scrap-collection sites around town. Hooklifts offer significant advantages in efficiency, comfort and safety. Consider that cable loaders require operators to climb down from the cab, hook a cable onto a container and winch it aboard. A slow process to be sure, and a miserable one at that if it’s conducted in the extreme heat or cold encountered in many states! Repeat that procedure (and potential misery!) multiple times a day and you’ll understand why hook loaders look so good to scrap recyclers and their crews. Hydraulic hooklifts are faster than cable loaders, enabling more hauls per day. Don’t overlook the operator comfort factor, either. In today’s economy where many driving jobs are not filled, hook loaders can be a game changer in attracting and keeping qualified operators! Then there’s the matter of safety. A hooklift driver can drop off an empty scrap container, hook a loaded one and roll it aboard from the security and comfort of their cab. Fewer drivers slips and falls on icy surfaces. And, no exposure to winching cables and the safety risks associated with moving machinery. With an eye toward improving employee well-being (and reducing worker’s compensation claims), it’s no wonder why so many scrap metal company officers are more comfortable with hydraulic hook loaders, too!